What new ideas can help workers market their skills and foster entrepreneurial learning? In other words...how do you get to your dream job!? PSFK Labs, a leading source for trends in design, advertising, and media invited Stark Design, along with creative agencies from around the world to generate product and service concepts that leverage “Future of Work” trends. As creative lead on this project, I conceived and designed the data-rich career-mapping tool. Since I had already been doing a lot of thinking about dream jobs, it was a logical next step to visualize them. 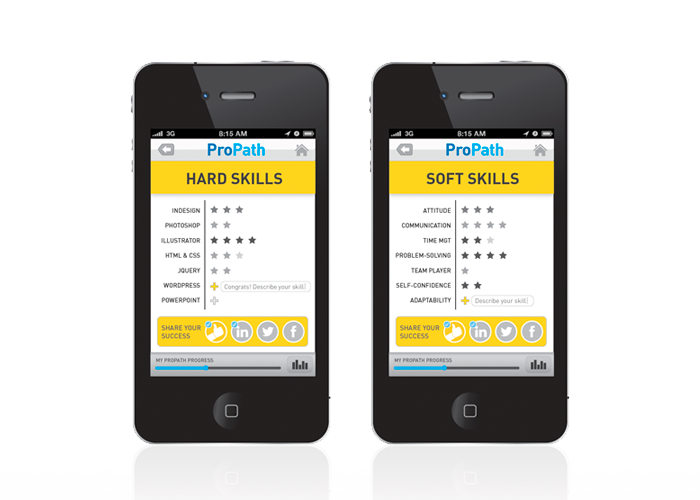 The concept app, ProPath, can be used by any professional at various stages of his or her career, providing guidance, data feeds and intelligent mapping of an individual’s many possible job tracks. PSFK loved our ProPath concept so much we were shortlisted along with entries from Smart Design and Zemoga and included in its Future of Work trend report.